1 x Original Genuine Sony EC310 Micro USB to USB Adapter OTG Cable for Xperia Z Z1. This original Sony EC310 cable can transfer data from your computer or old phone to your new Sony smartphone. Compatible with the Sony Acro S, Xperia Ion, Xperia S, Xperia SP, Xperia T, Xperia TL, Xperia TX, Xperia tablet Z, Xperia V, Xperia Z, Xperia Z1, Xperia Z1S, Xperia Z Ultra, Xperia Z2 and Xperia Z2 Tablet phone models. 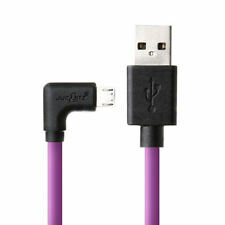 You can also use this cable with a computer or Laptop for Charging, Data Transferring or Syncing. Type: USB To Micro USB Cable. 1X Micro USB Cable. Connector 1: Micro USB. Connector 2: Standard USB. Condition: New. Xperia Z3,Z3 Compact,T3,Z2,Z1,J, Z5 premium, compact. Connect the USB end of the cable to your device and the other to your computer or laptop's USB port and enable synchronization and charging. Original Sony product. 1M Micro USB Charging Data Cable. plug into computers port and USB Power Adaptor. For all SONY Devices. Compatible with Sony Smartphones & Tablets. Long Lasting wire. SUPER FAST. Fast Charging. 1x 3m USB 2.0 MICRO Cable Data & Charging Lead Cable. Good build quality USB cable made to highest spec. High Speed USB 2.0. Copy data or back-up data from your phone to PC. Provides high-speed data transfer rates. Sony Aspen, Naite, txt, txt pro, Vivaz, Vivaz Pro, Xperia 8, Xperia X10, Xperia X10 mini, Xperia Active, Xperia Arc, Xperia Arc S, Xperia Go, Xperia mini pro, Xperia mini, Xperia Neo, Xperia Neo V, Xperia P, Xperia Pro, Xperia Play, Xperia Ray, Xperia S, Xperia Sola, Xperia T, Xperia U, Xperia Z, Xperia Z Ultra, Xperia Z1, Xperia Z1 Compact, Xperia Z2, Xperia Z3, Xperia Z3 Compact, Xperia Z3 , Xperia Z5, Xperia 5 Compact, Xperia Z5 Premium. SONY MICRO USB to USB OTG ADAPTER CABLE EC310. Compatible Model: FOR SONY Z, Z1, Z1 MINI, Z2, Z2 TABLET, Z2 TABLET WiFi, Z3, Z3 MINI, Z3 COMPACT, Z3 PLUS, Z3 TABLET COMPACT, Z3 TABLET COMPACT WiFi, Z4, Z4 TABLET, Z5, Z5 MINI, Z5 COMPACT, Z5 PREMIUM, X, X PERFORMANCE, XA, XA PREMIUM, XA ULTRA, C4, E3, E4, E5, M5, M4 AQUA, AQUA GO, AQUA P, AQUA M, AQUA T.
Depending on your phone, service provider and software. USB 2.0 A To MICRO B Data and Charging Cable 85cm long Lead BLACK. • 1 x Male A Plug to 1x Male Micro B Plug. This is a high Quality Micro USB Charging Data Cable Lead. 1m cable length. 2x Genuine Sony EC803 Micro USB Data Cable for Android devices. This is a Genuine Sony EC803 Micro USB Data Cable. The Sony EC-803 Micro USB Data Cable is compatible with most Micro-USB devices. Small and compact, perfect for travel use.